The Ultima Weapon boosts your combos for continuous damage. Enemy damage can be avoided by allowing you to phase and teleport out of harm's way. The keyblade also formchanges into the Ultimate Form. To unlock this keyblade you need to wait until the end of the game and even then you need to find some rare materials to synthesise it. This keyblade is unlocked by gathering and playing 23 Classic Kingdom Mini Games. It has the highest Magic stats in the game and having MP Haste enables it to constantly replenish your Magic allowing you to cast a huge amount of spell damage. The Boom Hammer and Clock Drill formchanges both focus on melee attacks. 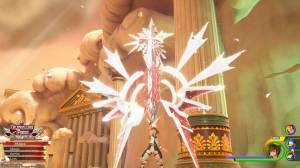 This is a strong Keyblade that you can obtain by going through the main story. Its attack power and range makes it easy to use against enemy mobs or in single-target boss fights. The Highwind formchange turns it into a spear and you get permanent access to the Waterza spell. Ability - Freeze Protection You will obtain this keyblade which specialises in long-ranged attacks and gives you Freeze Protection when you complete Arendelle. The Blizzard Claw formchange turns it into two icy talons that are effective when fighting multiple enemies as it allows you to chain attack between them. The Blizzard Blade is similar but can hit even more enemies as it has a wider arc. You will recieve the Ever After keyblade once you have completed the Kingdom of Corona world. This weapon has high Magic stats and excels in mob fights aginst many small enemies in an open area. The Leaf Bracer formchange means that whenever you use Cure or any of the more powerful versions you will not be interrupted.